Choose to cultivate a curious attitude. 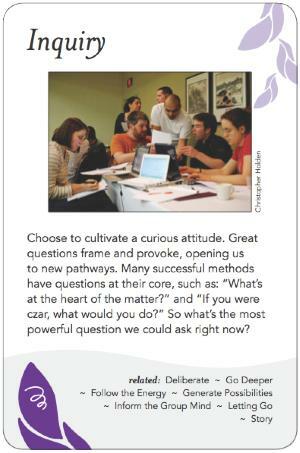 Great questions frame and provoke, opening us to new pathways. Many successful methods have questions at their core, such as: "What's at the heart of the matter?" and "If you were czar, what would you do?" So what's the most powerful question we could ask right now? A central question can be the organizing principle for a whole dialogue, a whole event, a whole change process. Why do questions have such power? It's the cognitive piece, the opening - pulling the cognitive tension out. It says: I'm curious, I don't know, I'm engaged. We're wired this way; we want to know why, what it means to us. With a great question, we appreciate at once the purpose, the importance and the challenge of what we are working on together. A question is a more inclusive holder than a statement. Every question is, in essence, an invitation. It prompts learning, including deeper self-awareness. Potentially it can guide us to our blind spots, particularly if asked respectfully, Socratically, lovingly. A good question is generous, rather than ego-seeking; inclusive rather than exclusive; opening rather than closing. Questions are by nature ambiguous, which can be troublesome to some people, but which is part of what opens up new avenues of exploration. The facilitator can be the initiator of questions, or can be called upon to entertain and hold open a question for group consideration, or can be asked to respond to questions. A well-considered question can frame, bound, direct and inform any part of a group process. From the facilitator, it is an invitation to explore and a challenge to respond, but only after consideration, thought, and conversation. Facilitators develop intuition about when is the right or perfect moment for a question. A facilitator can ask a question to the group, or to small pairs/triads/quads to raise the energy, to go deeper, to ensure all voices are heard. An important question from a participant can provide impetus, can provoke, can jolt other participants into new ways of thinking, or can change the direction of the discussion and process. The facilitator needs to field such questions, and, when they are useful and intended for the deliberation of the whole group, re-present them to the group, and hold space for their engagement. The ability of the facilitator to appropriately and effectively respond to questions from the group to him or her specifically is critical, and takes skill and practice, especially in the case of apparently critical or disruptive or challenging or non sequitur questions. How to respond? How to respect? How to honour the group and the individual (acknowledge, redirect, "parking lot") appropriately? Living into the mystery, the not knowing. Being humble and open. A seemingly innocent question: "I may be missing something, but...."
Convening questions: "What is your passion for being here today?" Concrete questions: "What time is lunch?" Asking why is that important? And why is THAT important? And why is THAT important? Etc. A "great" question is not necessarily clever, but rather touches on what holds and invites the group, and is appreciative in the way of adding value. Questions that are leading to a particular answer, which are particularly dangerous on the part of the facilitator (can be manipulative) e.g. "You're going to do that aren't you?" Double negative questions which can be misleading, confusing: "Is this not the wrong way to go?" "You haven't finished with that yet, have you?" Novice question: How do we get there? Mentor question: How do you think you might get there, if you are ten times braver than you're feeling right now? Peter Block: "The Answer to How is Yes"